Many homeowners are under the assumption that septic system permits aren’t necessary if they live outside the city limits. While permit exception may apply to some construction aspects, all on-site sewage facilities (OSSF’s) in Texas are required to have a permit, unless specific criteria is met per TCEQ regulations. The Texas Commission on Environmental Quality sets the minimum standards, and usually the county or other local authority enforces the regulations. Each county or local entity may have more stringent rules, so how do you know if you need a permit? Constructed – Any activity related to the installation, alteration, extension or repair of a system. Altered – An increase in the volume of permitted flow, a change in the nature of the permitted influent, a change from the planning materials that were approved by the permitting authority, a change in construction, or an increase, lengthening, or expansion of the treatment or disposal system. Extended – Altering the system by increasing the capacity, lengthening or expansion of the existing system. Repaired – Replacing any components that are not defined as emergency repairs or maintenance. Replacing tanks or drainfields is considered a repair and requires a permit for the entire system. Still have questions? We’re here to help. For professional, friendly service call 210-698-2000. 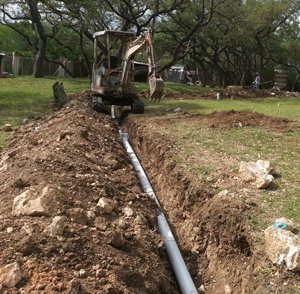 ← Why did they put my septic system there?